The latest house price index to come in for last year, this time from the property portal Fotocasa.es, supports the idea that the crash is over, but also that house prices have run out of breath after climbing up towards zero. Resale asking prices fell 0.8% in 2015, down from an average of 1,632 €/m2 in 2014 to 1,619 €/m2 in December 2015, according to Fotocasa. Last year’s house price decline was the smallest since the crisis began (see chart above), and provides more evidence that the Spanish house price crash has come to an end. A year ago prices were still falling by 5.7%, and by 10.% in 2012. House prices have “started to rise continually in certain areas because, after losing 45.2% in value, cheaper housing has coincided with the return of mortgage credit, which was prerequisite for the sector to come back to life,” comments Beatriz Toribio, head of research at Fotocasa. Resale asking prices rose the most last year in the Balearics (3.3%), La Rioja (2.4%), Madrid (1.4%), and Andalusia and Galicia (0.7%). Two-speed markets can even be found in close proximity. 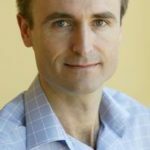 “In the cities of Madrid and Barcelona prices are consolidating their recovery, but on the outskirts of those cities the evolution is more unequal,” says Toribio. Spanish house prices peaked in April 2007 at 2,952 €/m2, and since then have fallen 45.2%, with the biggest falls in La Rioja (-55.1%), Castile-La Mancha (-52.6%), Navarre (-52.5%), Aragon (-52%), Murcia (-49.9%), and the Valencian Community (-48.3%). Prices have fallen the least in Galicia (-31.5%), the Balearics (-33.1%), Castile & Leon (-36.3%), and the Basque Country (-37.3%), all according to Fotocasa. 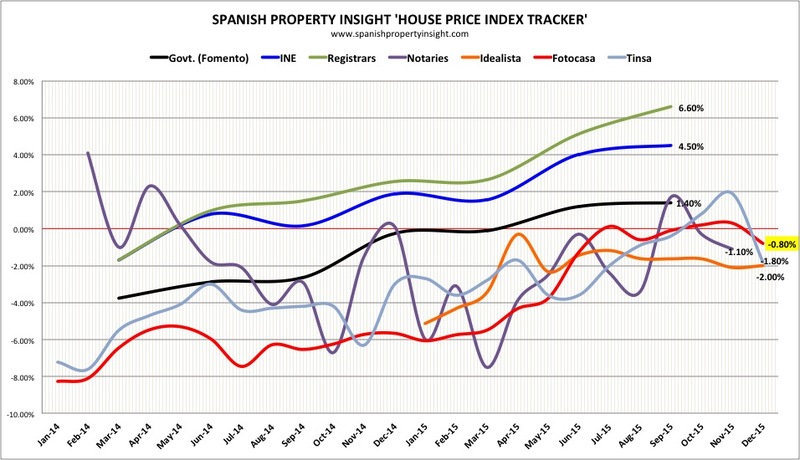 How does the Fotocasa index for 2015 fit into the SPI House Price Index Tracker, which includes seven of the most widely-watched indices in Spain? Four of the seven, all of them monthly figures from private sources (rather than official figures) including Fotocasa, suggest that price declines are shallower than before, but turned down in December. So prices look to be more or less stable, but still slightly negative at the end of 2015, with little sign of upward pressure on the horizon. It’s worth noting that these are all average prices for the country as a whole, and disguise big regional variations, with prices rising substantially in some local hotspots in places like Madrid, Barcelona, the Costa del Sol, and the Balearics. In Madrid, asking prices rose in 13 out of 21 districts, led by Centro (+13.7%), Salamanca (+9.3%), and Chamberí (8.6%). In Barcelona, prices were up in 9 out of 10 districts, led by Gracia (10.1%), the Ciutat Vella Old Town (8.5%), Eixample (8.4%), Sants-Montjuic (8.2%), Horta-Guinardó (6.9%), and Sarria-Sant Gervasi (6.8%). EU house prices rose 3.1% in Q3 last year, and Eurozone house prices rose 2.3%, the biggest increase since 2008. By country, the biggest in increase was in Sweden (+13.7%), followed by Holland (8.9%), whilst prices fell in Lithuania (-7.6%), Croatia (-3%) and Italy (-2.3%), all according to data from Eurostat, the EU data office. Using figures from the Spanish National Institute of Statistics, Eurostat has house prices in Spain rising at 4.5%, somewhat above the EU average.